A rich moisturising detangler, A’kin Avocado & Calendula Conditioner is ideal for dry, long hair. A complex of nutrients combined with extracts of calendula create this deeply nourishing and conditioning crème. 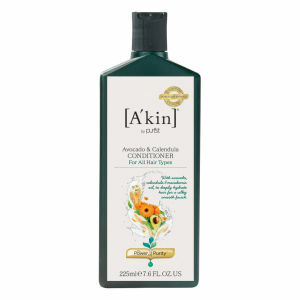 A’kin hair conditioners use the purest and gentlest caring ingredients, chosen for their hair and skin friendly compatibility, carefully crafted into highly effective formulas to give you more beautiful, lustrous, manageable and healthy looking hair. A’kin Avocado & Calendula Conditioner uses plant protein to seal in moisture while a special rapeseed detangler smoothes and silkens each hair. For oily hair use on the ends of the hair only.